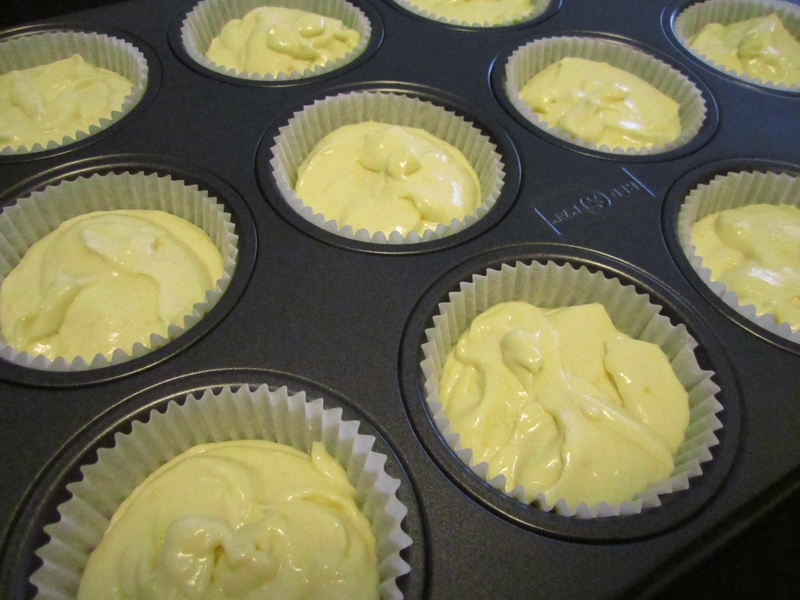 I felt like lemon cupcake so I made myself some! 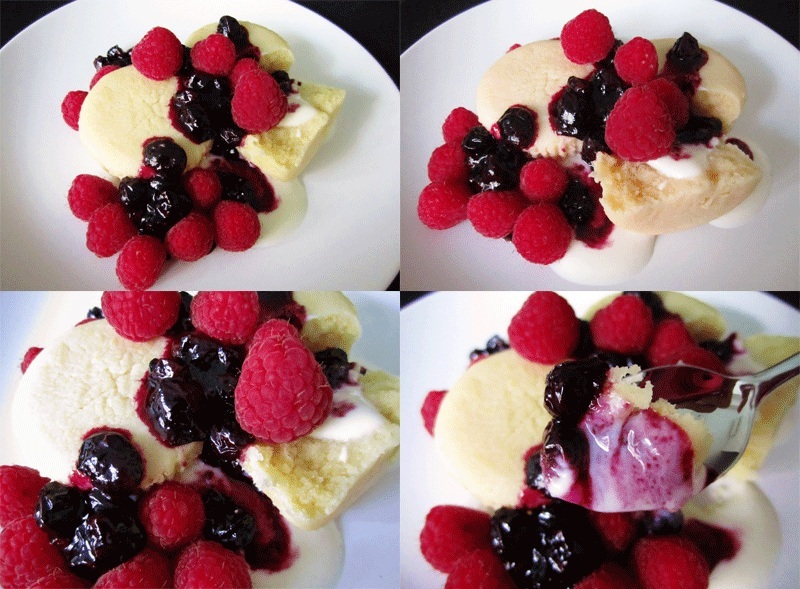 There were fresh, beautiful berries in my fridge as well as Rachel’s Organic Vanilla Yogurt. I made a blueberry sauce, arranged a pretty plate, ate it and was happy. I’ve expounded on my love of pancakes in Ja-Oui. It seemed like I had to give them up but I changed my mind. I do not want to give them up. 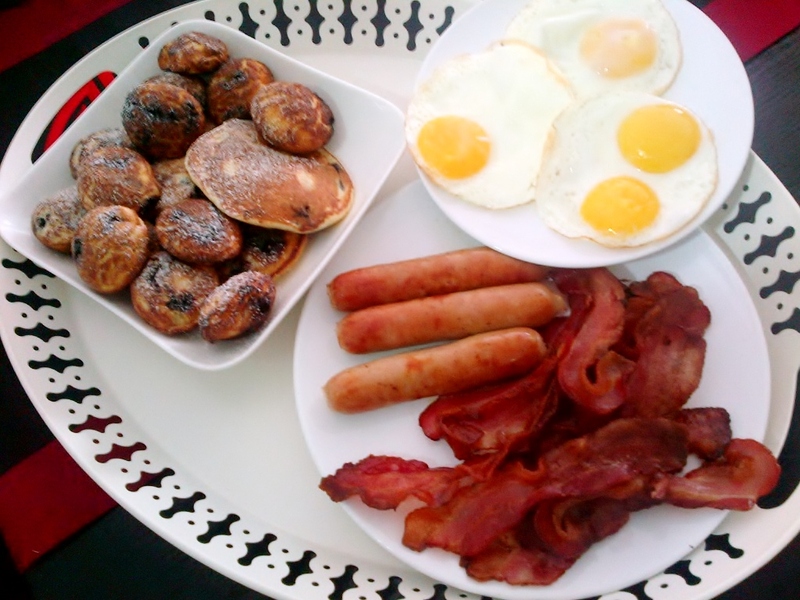 I will just have to put in more effort to make them for me plus the usual bacon, eggs and sausages for my DCM. 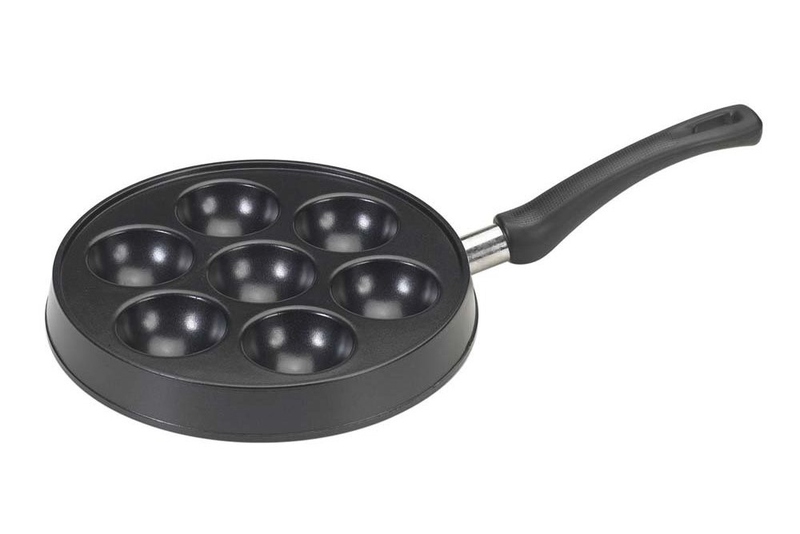 I bought Nordic Ware’s Danish Ebleskiver Pan from Amazon many months ago and have yet to make Ebleskivers. I have not been able to get my hands on a good recipe. Well actually, I do have a recipe but it is in Danish. My DCM verbally translated it for me very very early in the morning which translates to Gg did not capture any of it in her brain. Blueberry Ricotta pancakes have plagued my mind for many months now and since there has been an abundance of blueberries recently, I went ahead and made blueberry Ricotta pancakes and Ebleskivers. This is considered a bit of a cheat as the recipe for Ebleskiver batter is not the same as pancake batter. I just wanted to use the Ebleskiver pan is all. I got my recipe from Joy Of Baking. I thought it was ok but not the best pancakes I’ve had. Will have to try another recipe next time. They make a great snack too! Cannot wait to make proper Ebleskivers! Here’s a little tip. It is fine to stir blueberries into pancake batter when you want to make pancakes. It is not fine to stir blueberries into batter when making Ebleskivers. 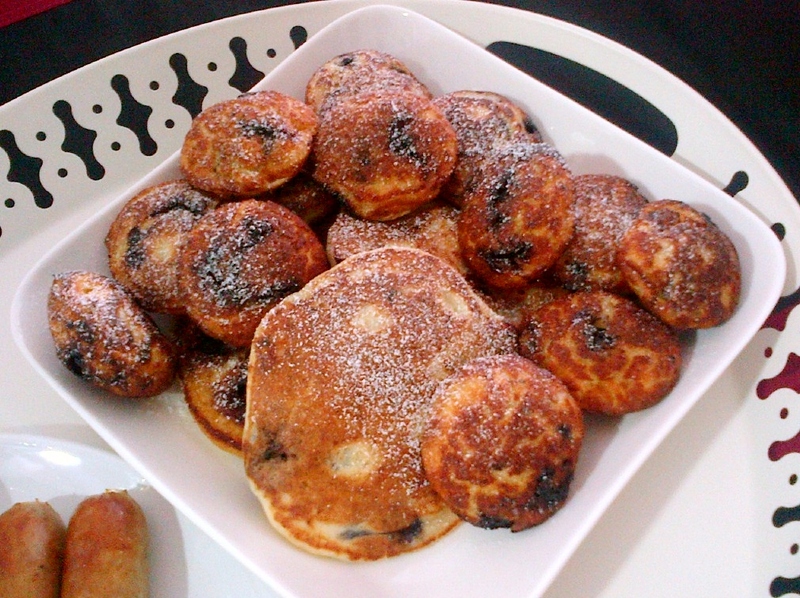 Ebleskiver take longer to cook which equates to burn blueberries. Insert blueberries (or whatever fruit or filling you are using) into the middle of the batter after it is spooned into the Ebleskiver pan. Another tip, do not use low-fat Ricotta. It is a lot softer and mushier so it blends into the batter which gives it a gummy texture. Full-fat Ricotta keeps its shape better so you get little bits and chunks. Better yet, leave it out of the batter and loosely stir it with some good honey to top your pancakes or Ebleskivers. 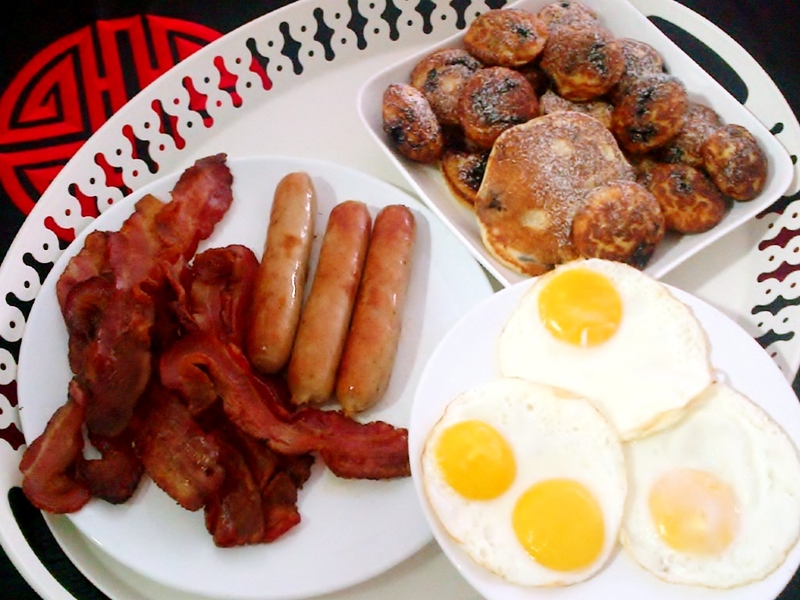 I cooked up crispy Danish streaky bacon, brats and Sunny-Side-Ups to even out the salt-sugar equation and all was good. 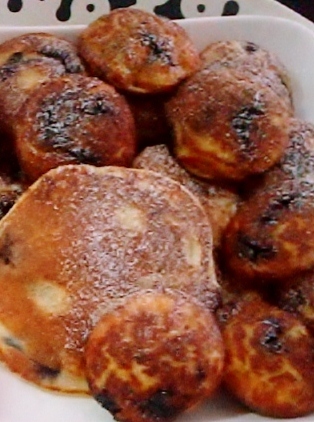 I am going to get my DCM to translate the Ebleskiver recipe when I am in a lucid state. I want to make Ebleskivers proper! Right now, I’ve got a pancake craving that needs satisfying. That will have to wait… But not for long. 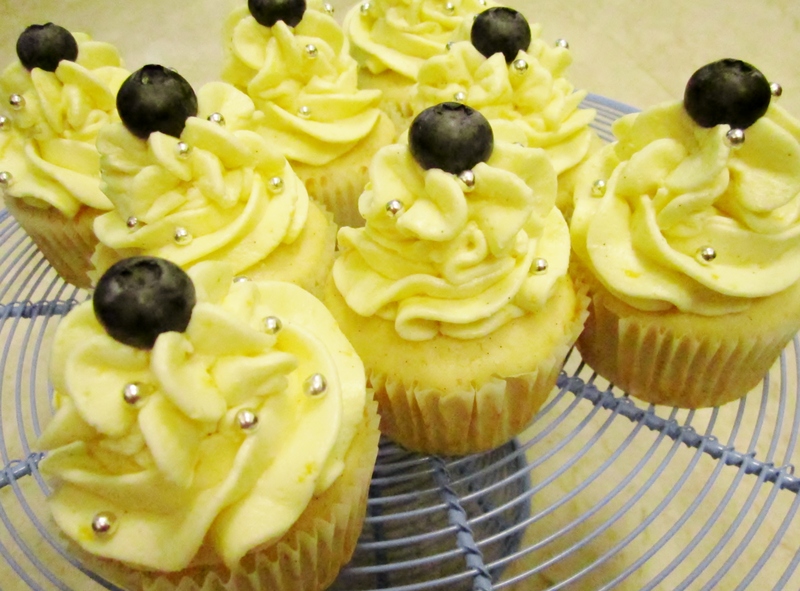 Lemon Buttercream is SOOOOOO nommy! 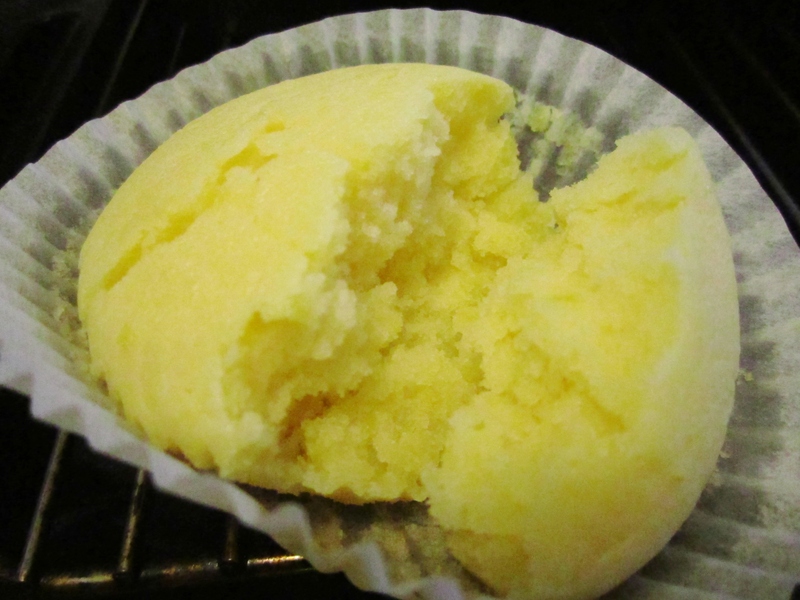 Much as I was over the moon with how well my Vanilla-la-la cupcake turned out, it is a cupcake that needs frosting. 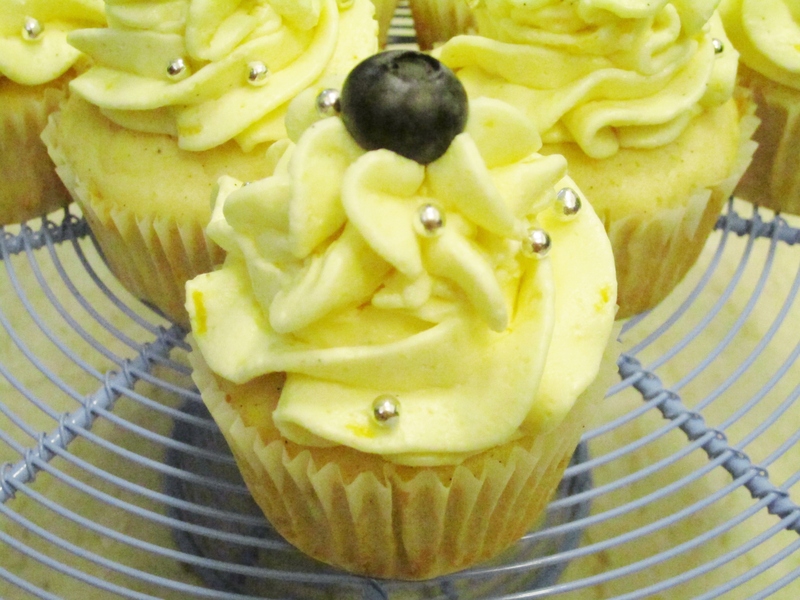 The great thing about a vanilla cupcake is that it is so generic, there isn’t anything you cannot top it with. A pink vanilla buttercream with sprinkles seems to be the de rigueur frosting for vanilla cupcake. Vanilla on vanilla? I love pink but, boring much? 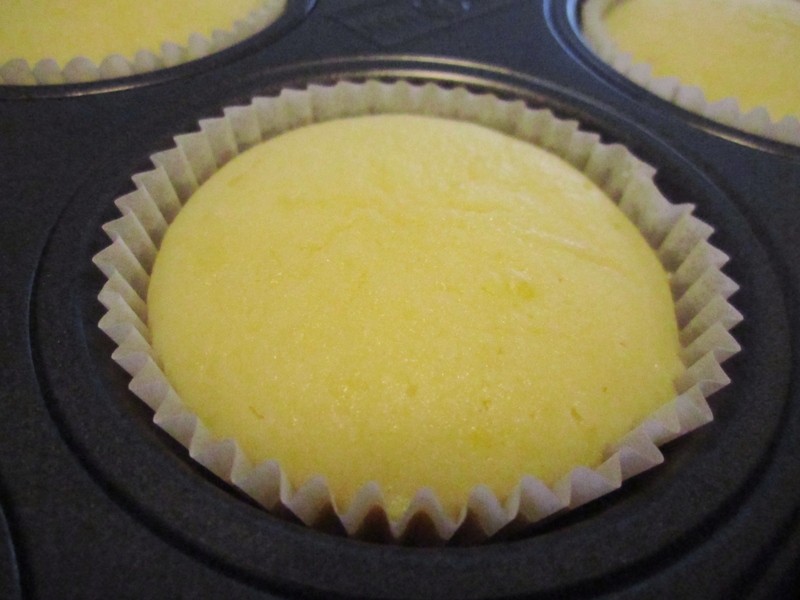 I had some of the sticky lemon glaze left over from my lemon cupcakes a.k.a. The Tart and lots of lemons. 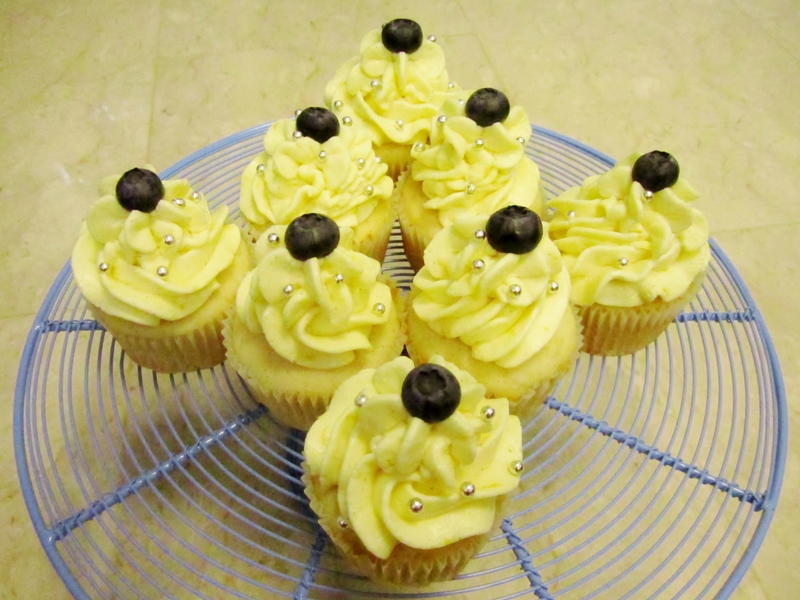 Lemon buttercream anyone? Lemon buttercrea…Mmmm is my new love. I whipped it till it was creamy, smooth and stiff. Imagine if you can, a burst of lemon sunshine in a cloud. 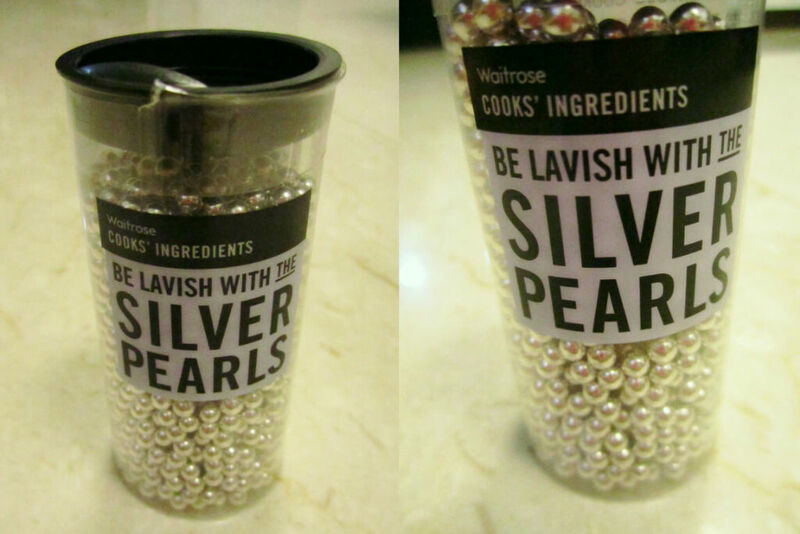 Since sprinkles are called for, I decided on my Waitrose silver pearls. I love Waitrose’s products!!! I would love to have every single Waitrose product there is… Their products are packaged in such a way that although simple is so appealing; and they really pay attention to what they create. QC Baby! Pretty as it was, the duckling yellow dotted with bits of silver lacked a little contrast in colour. I guiltily remembered the punnet of raspberries I’d finished earlier in the day for a snack. 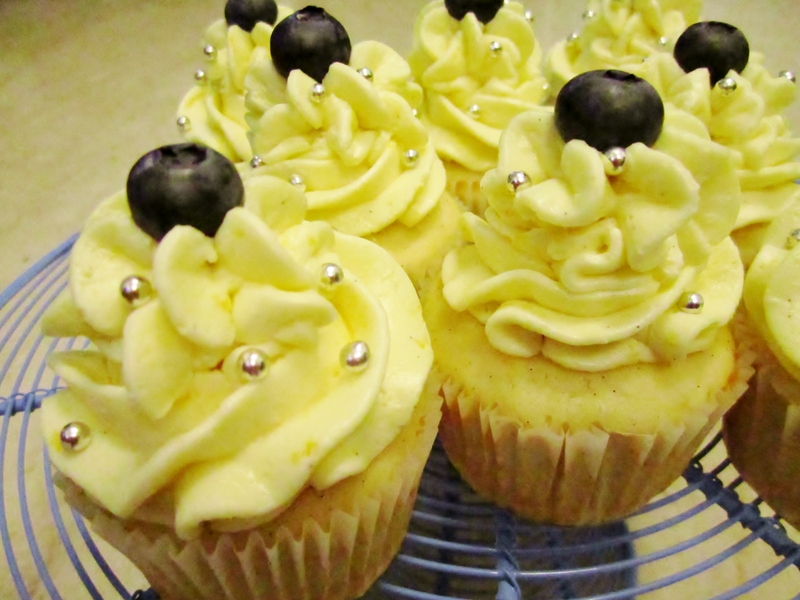 How lovely would a luscious red raspberry look atop that little swirly hill of lemon buttercream…? My blueberries will have to do instead. 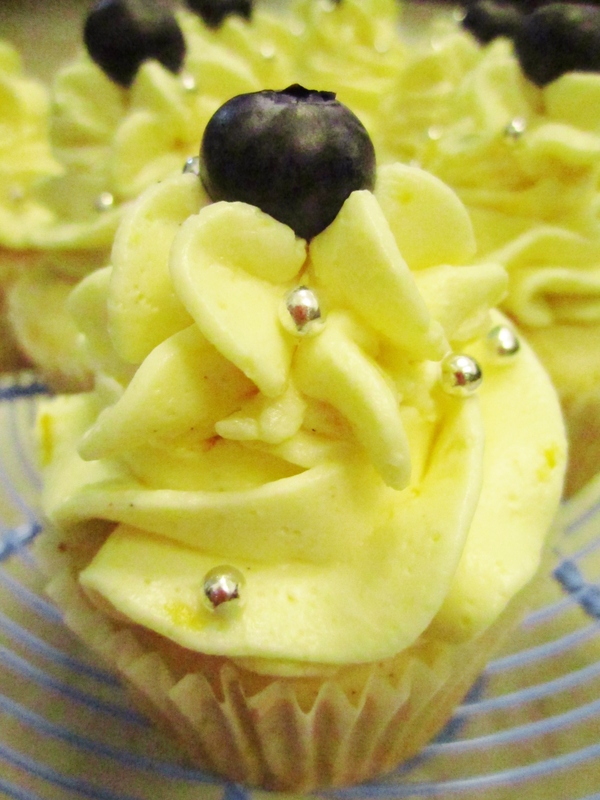 Can you spot the bits of lemon zest in the buttercream? Although they weren’t the burst of colour I had intended, they are still pretty, aren’t they?